After our grand tour with Paddywagon, we had a day on our own in Dublin. 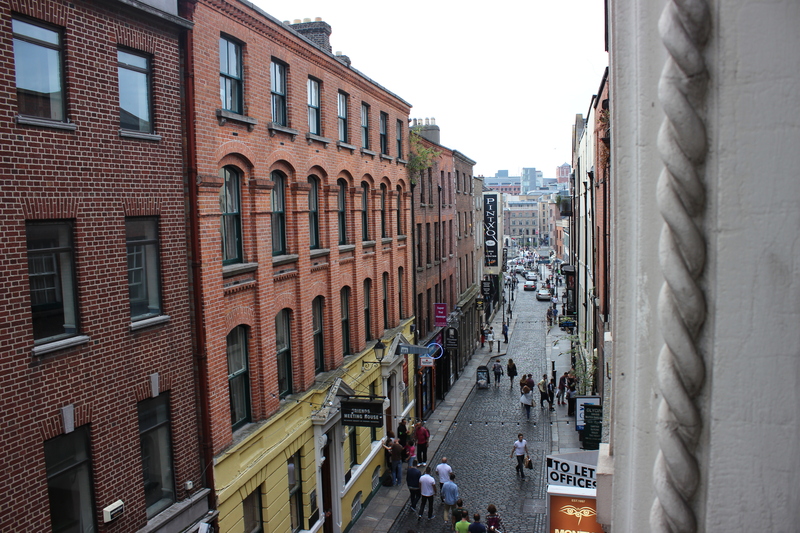 We booked with the Apache Hostel, located in the Temple Bar district. Financially, it’s gonna be one of your best bets. And though it offers private rooms, it’s still a hostel. We had a shared bathroom and our room was the bare minimum. But when you’re only paying €50 a night to stay in the heart of Dublin during tourist season, you don’t worry too much about it. One of the downsides of staying in Temple Bar, at least on a weekend, is that it’s noisy. People were outside our window all night, yelling and laughing and breaking bottles. I recommend keeping your windows closed. Our room at the Apache was bright and airy and relatively clean. The bed was comfy and the reception was 24-hour (important when you have to leave at 4AM). Really, the only complaint I have is that the shared bathroom, predictably, was a bit gross. Not a big deal though, because we spent most of our time exploring the city. We headed out around 9 in the morning hunting for breakfast. We were surprised to see that even a breakfast-serving cafe in Temple Bar didn’t open until 10. (Side note: Ireland has not come around to the idea of establishments posting their hours. You just have to cross your fingers and hope for the best.) 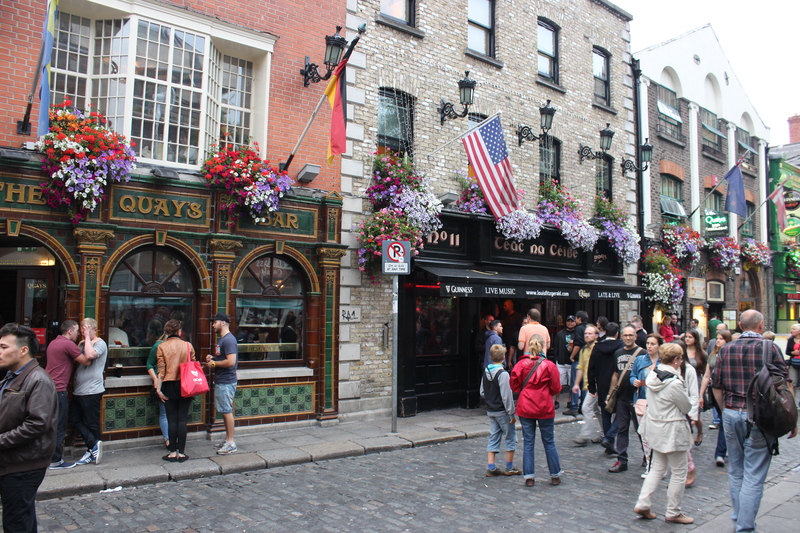 It may have been that it was a Sunday, or it may have been that Temple Bar is primarily a night-life area. Anyway, we walked around a little bit, looking for other breakfast places and not finding a whole lot. One of my favorite things about Ireland and the UK is breakfast culture. It’s very important. Right up there near tea. In Italy, breakfast is an espresso/cappuccino and a croissant. That. Is. Not. Breakfast. 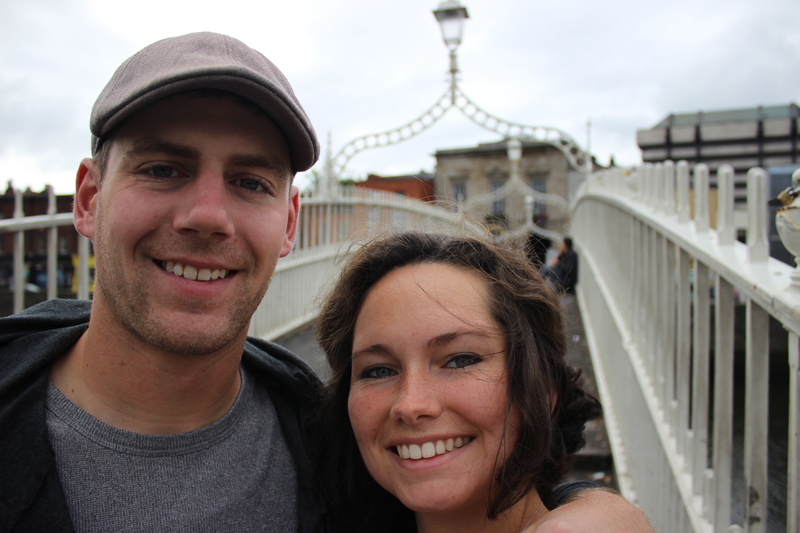 Anyway, we walked across the Ha’Penny Bridge, which at one time was the only bridge across the Liffey. To cross it, the toll was a half penny, or you could take your chances haggling with the boatmen for a lift. 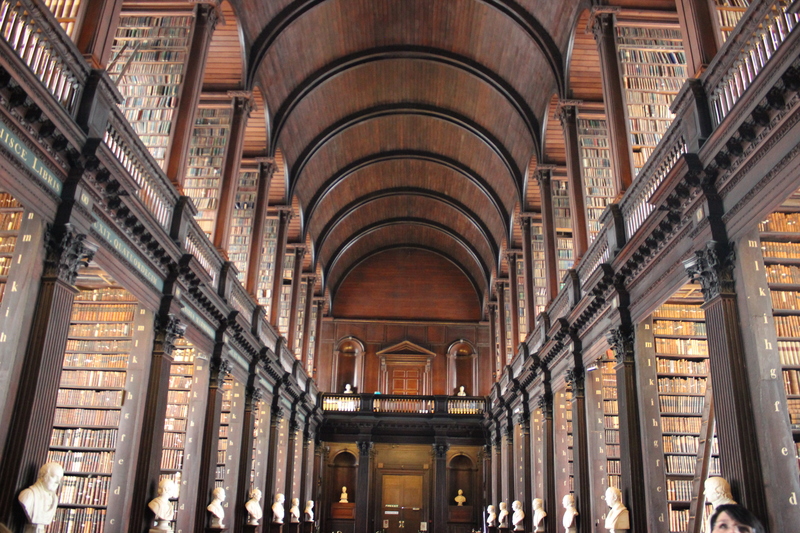 After the breakfast place opened and we’d stuffed our faces, we went to Trinity College to see the Book of Kells. Admission to the library is €10 a person, and afterward I was a little irritated that we had spent €20 “just for that.” The Book of Kells is magical, I agree. However, they turn a single page every day and not every page is particularly exciting. 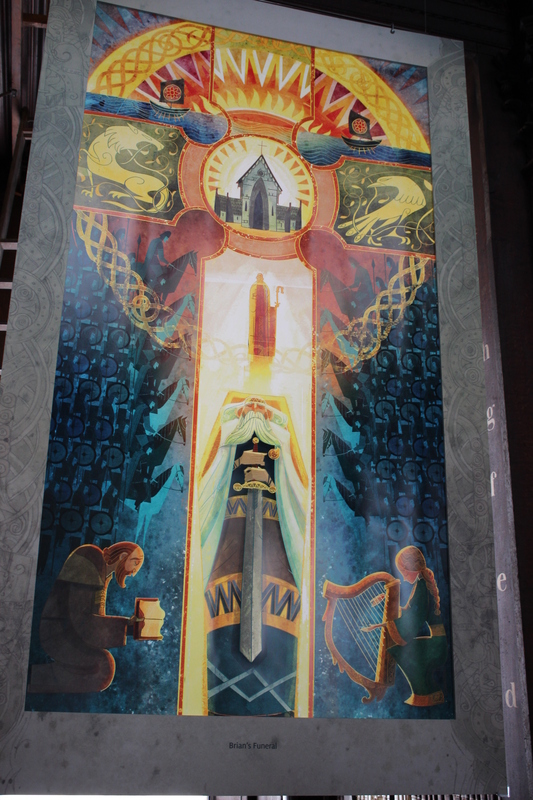 I recommend watching the movie The Secret of Kells instead. The animation style is enchanting (like the illuminations it’s based on) and it’s just a great movie over all. The exhibit about illuminations (called “Turning Darkness into Light”) is interesting, but if you’re not a museum person then it’s more of a scan-while-you-walk experience. What we truly enjoyed was the temporary exhibit they had in the Long Room. This summer they have an exhibit about Brian Boru, the first emperor of Ireland. The gorgeous illustrations and concise story were fantastic. In the gift shop we had to hunt to find a booklet of the Brian Boru exhibit, but it DOES exist! After that, we walked south along the pedestrian Grafton Street. 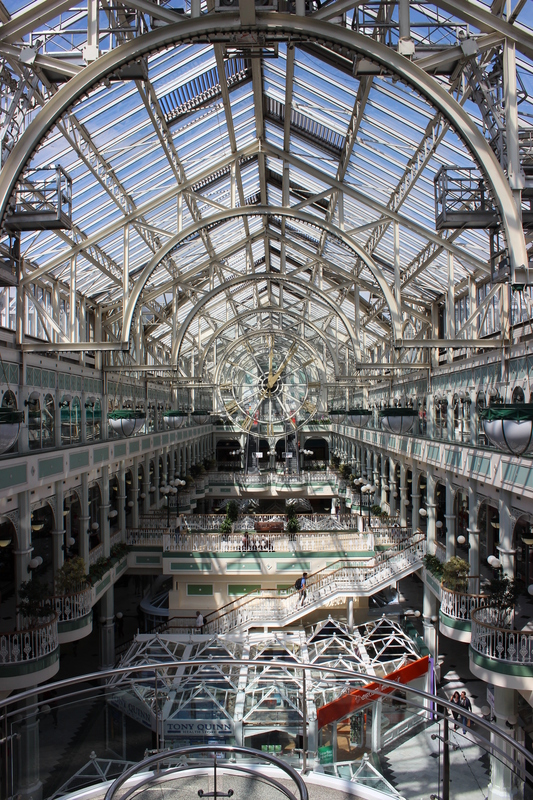 Grafton Street is great for shopping and restaurants, and it ends at St. Stephen’s Green. 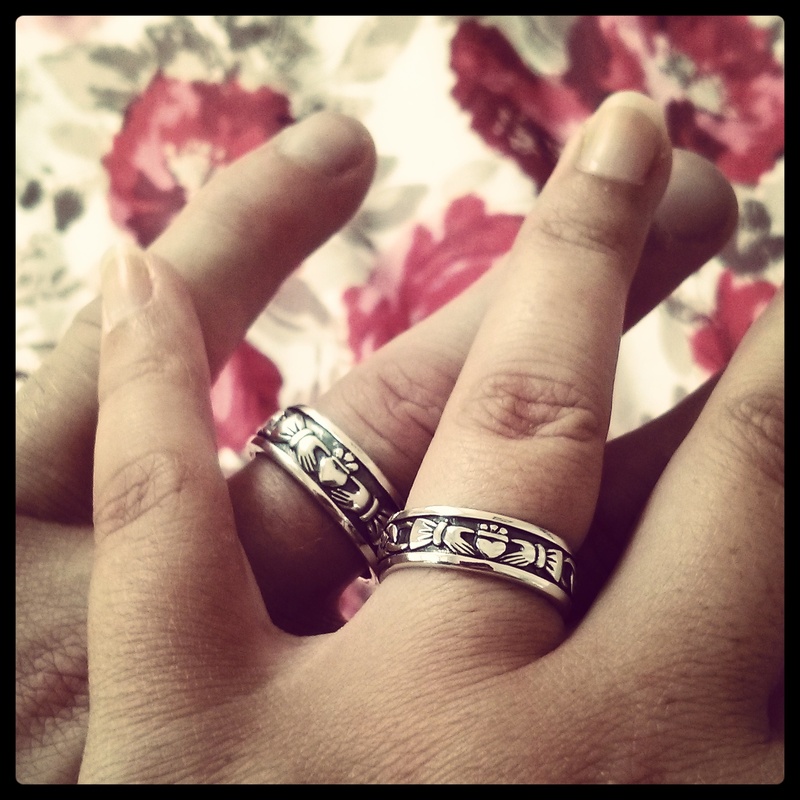 We had decided a few days prior that we were ready to invest in some new Celtic wedding bands, so we spent most of the day on the hunt for jewelry stores. If for some reason you want to shop for jewelry on a Sunday, you’ll have a tough quest. Most jewelry stores in Dublin are closed on Sunday. However, we did find an open Celtic jewelry store at the bottom of Grafton Street that had bands we liked. Hooray! 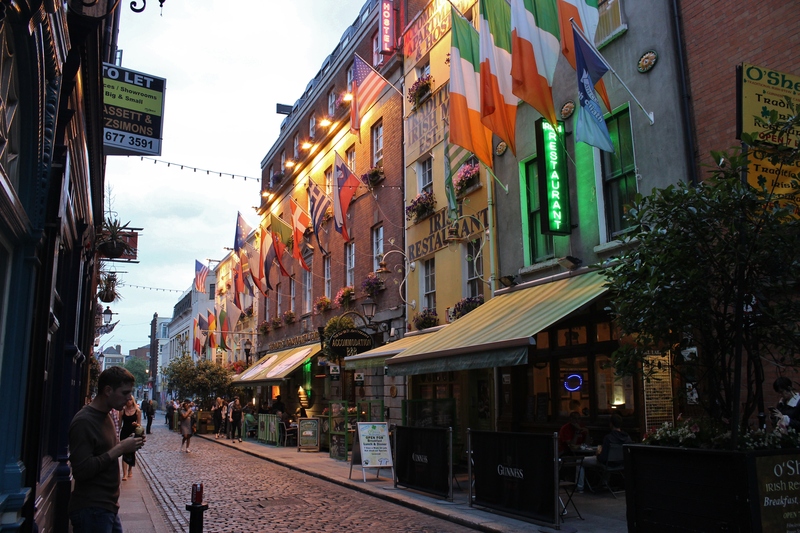 Then it was back to Temple Bar to find somewhere for dinner. It was still a little early to be truly hungry, and as we approached a restaurant I noticed a tattoo and piercing shop across the street. We had been halfheartedly looking for one throughout the day because I had been planning to get my lip pierced for a few weeks. So we popped in to kill a little time and check prices, and I came back out 20 minutes later with a shiny new piercing. The shop was called Connected Ink, and the piercer did a great job. Finally we went over to the Old Storehouse restaurant and splurged on pints, mussels, wings, pints, fish n’ chips, and pints. 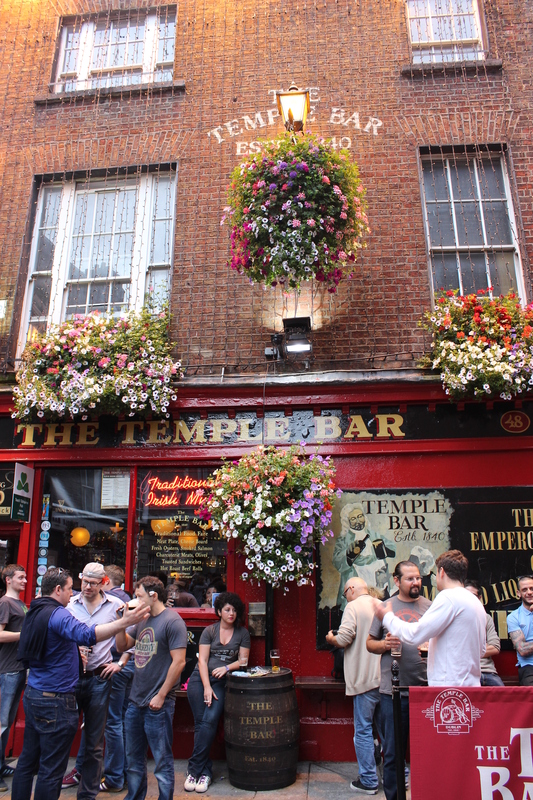 The place is delicious, but no matter where you eat (or drink) in the Temple Bar area, you’re going to pay a little more than average. All the live music makes up for it though – almost every establishment has live music… starting in the afternoon… every, single, day. It’s a beautiful thing. Since we had to get up at such an ungodly hour, we didn’t stay out late, but we did make sure to go to THE Temple Bar for a pint before calling it a night. 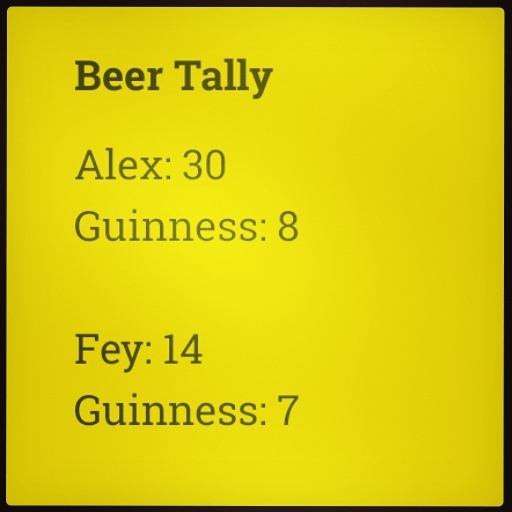 I tallied up our pint scores, and I think we did pretty well. Naturally there’s a lot more to see in Dublin, but when you only have one day to see it (and you’ve just spend the last six in constant travel) you might as well take it easy. We’ll see more of it next time. I hope you’ve enjoyed our Ireland vacation! It was an amazing trip and you can probably see why it’s my favorite place in the world. Now I guess I should start planning our next adventure…. 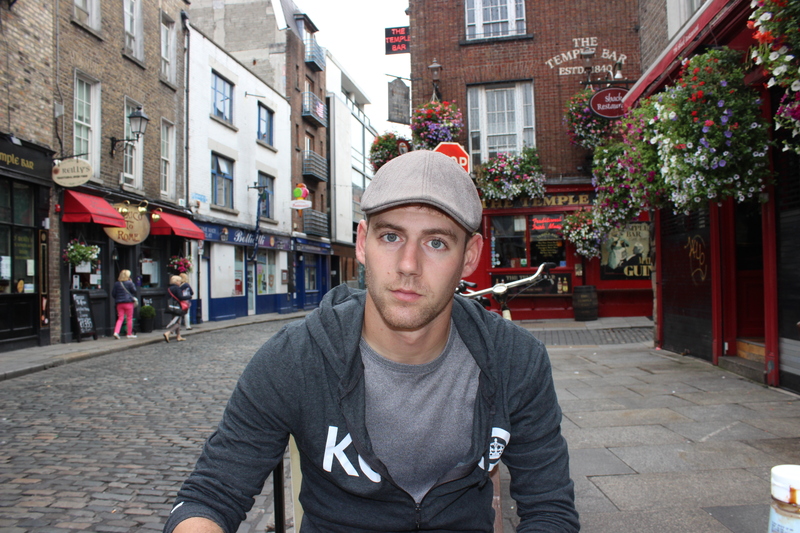 This entry was posted in Ireland Adventure, Travels and tagged bar, Book of Kells, dream destinations, Dublin, Ha'penny Bridge, honeymoon, Ireland, music, piercing, pub, Temple Bar, Trinity College. Bookmark the permalink. Really enjoyed the past few pieces, I moved out of Ireland about eight months ago ad it was a nice little touch if home! Thanks for reading! It was hard for us to leave after 8 days – I can’t imagine leaving after actually living there! 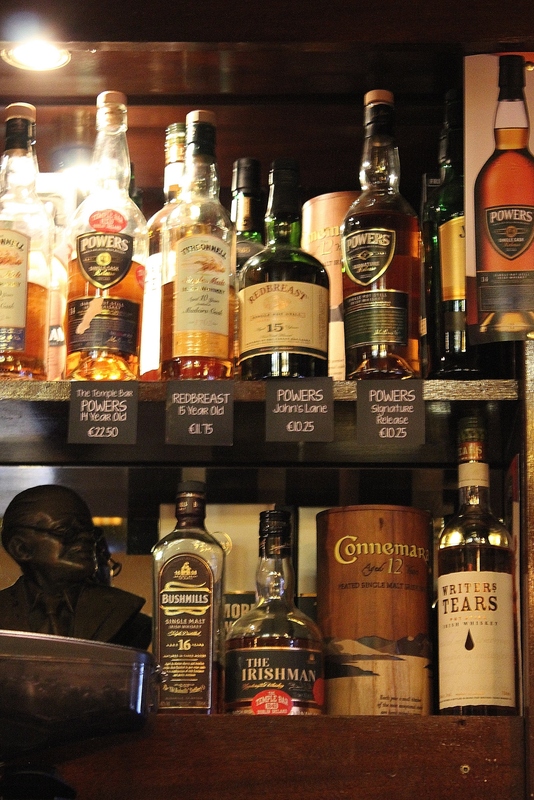 We’re going to look into moving to Ireland or the UK…. Any tips for us? Em, well I know that if I was to move back to Ireland it would definitely be Sligo or Galway. Relatively cheap laces to live, and both are great cultural towns. Also very beautiful parts of the country.